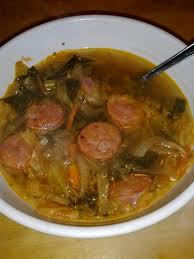 Here’s a simple take on a sausage-based soup that’s sure to satisfy your pallet after a brisk day of hunting. To make things even easier, you can cheat and go with a bag of pre-chopped slaw mix from the grocery store. 1. Over a medium-high burner, heat the oil in a saucepan or soup pot. Add the sausage to the oil and cook until brown. . Add the onions and cook until translucent, about 3 to 4 minutes. 2. Stir in the garlic and slaw mix to the saucepan. Cook, stirring frequently, until the cabbage is wilted. Sprinkle the salt and flour over the onions and cabbage and stir. 3. Add the water, broth, and red pepper flakes. Raise heat and bring just to the point of boiling. Reduce heat and simmer 10 minutes. 4. Stir in the parsley and dill. Serve with a thick slice of crusty bread.